Press Release, July 9, 2018. Recommended Lighting Practices for OILFIELD LIGHTING (2.4 MB PDF). Explanatory Video for Recommended Lighting Practices. Texas Collaboration Protects Dark Skies - International Dark-sky Association blog post. Dark Skies Initiative selected by Texan by Nature as a 2018 Conservation Wrangler recipient. When Staying in the Dark is the Brightest Idea from the Permian Basin Petroleum Association Magazine (September 2017). Railroad Commission of Texas Reminds Operators to Reduce Light Near McDonald Observatory. 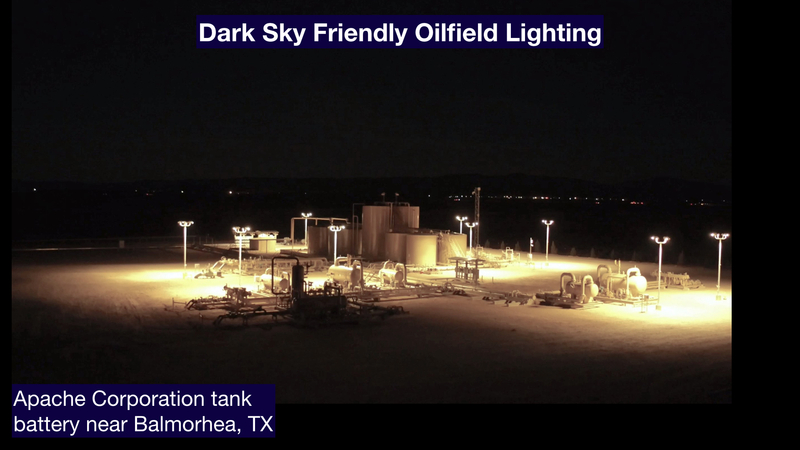 Upgraded Rig Lighting Improves Night Time Visibility While Reducing Stray Light and the Threat to Dark Skies in West Texas from the Society of Petroleum Engineers. Light pollution is any adverse effect of artificial light at night, including sky glow, impaired visibility from glare, light trespass, energy waste, and more. YES! Light pollution wastes energy and money, disrupts global wildlife and ecological balance, has been linked to negative consequences in human health, and negatively affects astronomers and scientists. Read on to learn more about specific issues. There is a WIN-WIN SOLUTION to light pollution! By changing outdoor lighting practices, you can prevent light pollution while putting more light where you want it using less electricity. Read on to find out how to make a positive difference. A billboard as an example of wasted light. • COSTS: In the United States $10s of billions annually in electricity costs are wasted shining light upward at night. These numbers do not include the costs of producing the energy to generate electricity. • ENERGY CONSUMPTION: Most of the energy required to power all of the wasted light comes from burning fossil fuels, contributing to other types of pollution. • HEALTH: New studies point to dramatic health consequences from the disruption of the natural human day/night cycle. Unnatural light at night affects hormone production and reduces the strength of the immune system. • SAFETY: Vision is impaired by "glare" from overly bright light sources, reducing sensitivity to fine details and color perception, especially in elderly people. Brighter lights cause shadows to appear darker. • THE ENVIRONMENT: Artificial light at night has been shown to disrupt the mating, migration, and hunting behaviors of many different species, and consequently the ecological community as a whole. • LOSS OF NIGHTTIME SKY: The view of stars and dark night skies is rapidly being lost. Generations are growing up having never seen the Milky Way. Sky glow resulting from artificial lighting dramatically hinders the science of astronomy. We can reclaim vast amounts of energy currently wasted inadvertently into the night sky by poorly designed outdoor lighting. We can do this by using light fixtures that are shielded to reflect light down where it is needed, as well as using the smallest number of lights and lowest wattage bulbs necessary to effectively light an area. • START WITH YOUR OWN HOME AND YARD: Lead by example in adopting good lighting practices. Put your own house in order first. Good downward-pointing light fixtures at Sul Ross State University in Alpine TX. • SPREAD THE WORD: The solution to light pollution is 90% education and public awareness, and 10% technology. Show examples of good lighting to your friends and neighbors. Once people see it in action, and understand its implications for cost savings and improved visibility, they are far more likely to adopt good lighting practices on their own. • CREATE CHANGE IN YOUR LOCAL GOVERNMENT: One house doesn’t make much of a difference compared to an entire city and large retail installations. The best way to make a significant difference is to help your local government create a new lighting ordinance that regulates lighting practices on a large scale. An excellent resource is the International Dark-sky Association. Resources and activities for teachers and educators can be found through the Dark Skies Rangers Program. The Strange Scourge of Light Pollution a 10 minute YouTube video.